at 8 weeks old on December 20,2018. She has a lot of adventures planned for you and her, She loves to share, and she is good at it too, She loves to cuddle with you in her doggy bed, Comes with love, sharing smiles. hello hugs and good night kisses Her lovable nature and attitude will bring a smile to your face that will last a lifetime! She is outgoing girl, with an abundance of personality! She can"t wait to meet you and lavish you with her puppy kisses, She wants nothing more than to be by your side. Jenna, is a very active.loving and healthy, purebred Siberian Husky doggy loves attention and doesn't mind giving tons of puppy kisses ! She will make a wonderful companion for her new family. She has the most stunning beautiful coat like his Father Sire (DJ) and has a wonderful personality like her Mother Dam (Bae)! . She will be ready to play but most importantly ready to love you always and unconditionally. How To Reserve Your Puppy. Steps To Use To Check Out. 1.Step one Click Read More on the puppy you're interested in. 2. Step two Add To Cart. Now you're in Shopping Cart , Click Checkout. 3. Login, Then Register Me. Existing Customer if you're already created account. If not go to next process. 4. Skip Login and Checkout as Guest. 6. Click on either I Will Pick Up My Puppy or Please Ship The Puppy To Me. Comments/ Instructions, Enter Your Information in here or Special Instructions in this box. 7. Puppy holding charges: Full Amount or $200 or Enter Your Own Amount In Box. Holding fee of $200.00 non refundable. The $200.00 holding fee will be taken off the price of puppy at checkout. This will secure your puppy til we agree on date for pick up or shipping. Checkout Step 2 Pay Now using PayPal Payment or Pay with Debit or Credit Card Secure site when checking out. Anywhere within the continental United States. Cost is subject to change by airlines price increase. 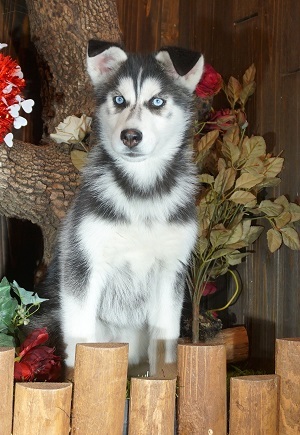 Call "BREEDER"( Loyal Siberian Husky right away.We will be glad to answer any questions you may have, and help you determine if Jenna is right for you.